The production of exosomes by tumor cells has been implicated in tumor-associated immune suppression. In this study, we show that, in mice, exosomes produced by TS/A murine mammary tumor cells target CD11b+ myeloid precursors in the bone marrow (BM) in vivo, and that this is associated with an accumulation of myeloid precursors in the spleen. Moreover, we demonstrate that TS/A exosomes block the differentiation of murine myeloid precursor cells into dendritic cells (DC) in vitro. Addition of tumor exosomes at day 0 led to a significant block of differentiation into DC, whereas addition at later time points was less effective. Similarly, exosomes produced by human breast tumor cells inhibited the differentiation of human monocytes in vitro. The levels of IL-6 and phosphorylated Stat3 were elevated 12 h after the tumor exosome stimulation of murine myeloid precursors, and tumor exosomes were less effective in inhibiting differentiation of BM cells isolated from IL-6 knockout mice. Addition of a rIL-6 to the IL-6 knockout BM cell culture restored the tumor exosome-mediated inhibition of DC differentiation. These data suggest that tumor exosome-mediated induction of IL-6 plays a role in blocking BM DC differentiation. Dendritic cells (DC)3 originate from hemopoietic stem cells within the bone marrow (BM). Under physiological conditions, progenitors differentiate into immature DC that subsequently circulate via the blood and are delivered to peripheral tissues, where they sample Ags of diverse origin, thus acting as APCs to stimulate the host antitumor immune response. It has been demonstrated that DC are not activated in human cancers and that their function is compromised by the tumor (1, 2, 3, 4, 5, 6). Several lines of evidence indicate that the ability of tumors to affect DC maturation and differentiation may result in a generalized failure of the host to mount an effective antitumor response. These findings and additional data (5, 7, 8, 9) are relevant clinically, as an association with significantly poorer prognoses in patients with several types of cancer has been described. Although these observations suggest that DC play a critical role in determining the final outcome of the immune response, the mechanisms responsible for this phenomenon remain uncharacterized, and the effects of tumors on DC function are poorly understood. The decreased frequency and immature phenotype of DC in the tumor tissues and in the peripheral blood of patients with tumors of the head and neck, lung, and breast, as well as those with multiple myeloma (8, 9, 10), suggest a systemic alteration in DC function. This, in turn, suggests that the release of soluble factors by the tumors contributes to the tumor-associated alterations in the activity of DC. Several reports have now confirmed that the release of IL-10, IL-6, macrophage colony-stimulating factor, vascular endothelial growth factor, and gangliosides and/or prostanoids by tumors can prevent DC differentiation and function in vitro and in vivo (7, 11, 12, 13, 14, 15). In this study, we found that exosomes produced by tumor cells target CD11b+ myeloid precursor cells in the BM. Interaction of the exosomes with the myeloid cells in vitro induced the production of IL-6 preferentially and suppressed their differentiation into DC. Tumor exosomes only partially blocked DC differentiation when BM cells isolated from IL-6 knockout (KO) mice were used in these experiments, indicating that the exosome-induced production of IL-6 plays a role in blocking DC differentiation. Seven-week-old BALB/c and C57BL/6j IL-6 KO mice (The Jackson Laboratory) were housed under standard laboratory conditions in the facility of Laboratory Animal Care at the University of Alabama at Birmingham. Animal care was in accordance with institutional guidelines, and all experimental protocols involving animals were performed using an institutional protocol that was approved by the Animal Care and Use Committee. The TS/A cell line, a moderately differentiated and immunogenic murine mammary adenocarcinoma of spontaneous BALB/c origin that is MHC class I+ (H-2Dd, H-2Kd) was maintained in vitro at 37°C in a humidified 5% CO2 atmosphere in air in complete medium (DMEM with 5% FBS) as described previously (16). The B16 melanoma cell line was purchased from the American Type Culture Collection and cultured in DMEM. The human breast cancer cell line MDA-MB-231 was purchased from the American Type Culture Collection and maintained in DMEM supplemented with 10% FBS, 2 mM glutamine, 10 mM HEPES (pH 7.4), and antibiotics (100 U of penicillin/ml and 100 μg of streptomycin/ml). FBS for use in cell cultures was exosome depleted by differential centrifugation using a method as described previously (17). Exosomes derived from TS/A, B16, or MDA-MB-231 cells were isolated from 1000 ml of culture medium containing ∼108 tumor cells using a sucrose-gradient purification procedure as described previously (17). The tumor-derived exosomes were collected in fraction 3 of the sucrose gradient. The nonbanded fractions (fractions 6 and 7), which contain nonmembrane protein complexes, also were collected and concentrated using a protein concentrator with a 100-kDa cutoff (Millipore) for use as the exosome control (E-control). The protein content of the exosomes and E-control was determined using a bicinchoninic acid protein assay kit (Bio-Rad). The samples were then aliquoted and stored at −80°C until use. The E-control was used in assays at the same protein concentration as the exosomes. TS/A tumor exosomes were labeled with the PKH67 green fluorescent dye using a commercially available kit (Sigma-Aldrich) according to the manufacturer’s instructions. The efficiency of labeling of the TS/A exosomes (>90%) with PKH67 was determined by FACS analysis as described previously (17). BALB/c mice 7 wk of age were injected i.v. 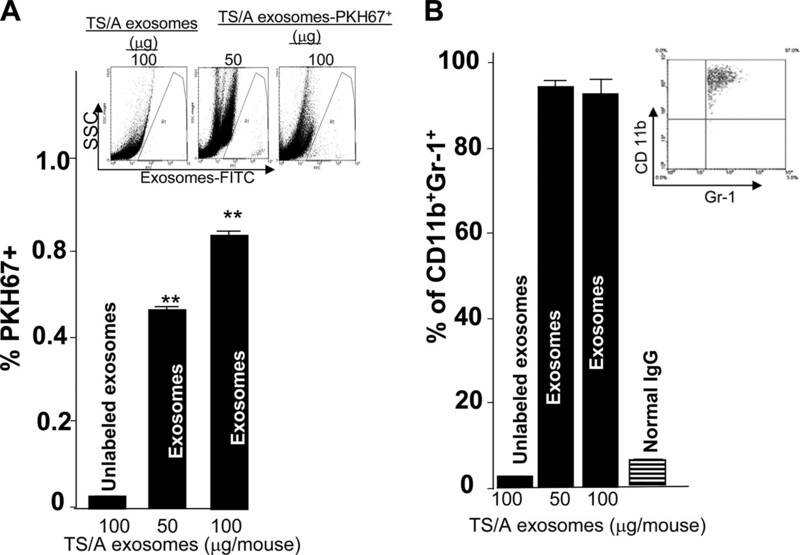 with PKH67-labeled exosomes obtained from TS/A cells (10 mice/group) or unlabeled exosomes obtained from the same cells. The mice were sacrificed 24 h after injection, and the spleen, lung, lymph nodes, and liver were resected and retained and the BM was collected. Single-cell suspensions of each tissue were prepared in RPMI 1640 medium and subjected to FACS analysis. The percentages of cells containing exosomes were determined by counting green fluorescent-positive cells. BM-derived DC were generated from primary cultures of femoral marrow from 6- to 8-wk-old female wild-type (WT) and IL-6−/− mice as described previously (18). In brief, BM cells were flushed from the femurs of 6- to 8-wk-old mice using an RPMI 1640-filled syringe to obtain a single-cell suspension. After erythrocytes were depleted, the cells were washed twice with RPMI 1640 (Invitrogen Life Technologies) containing 1% heat-inactivated FBS, and then resuspended in RPMI 1640 supplemented with 10% FBS, 1 mM pyruvate (Sigma-Aldrich), 1× nonessential amino acids (Sigma-Aldrich), 2 mM glutamine (Sigma-Aldrich), 50 nM 2-ME (Invitrogen Life Technologies), and 20 ng/ml recombinant mouse GM-CSF (PeproTech), plated at a density of 2 × 106 cells/ml in 6-well plates and cultured at 37°C in a 5% CO2 atmosphere. Various concentrations of TS/A tumor exosomes were added to the BM cell culture medium on days 0, 3, or 5. Fresh medium (0.7 ml) was added to each well every 2 days. Some cultures of BM precursor cells isolated from IL-6−/− C57BL/6j mice had rIL-6 (eBioscience) added to some of the wells every 2 days. After in ex vivo culture, the percentages of differentiated DCs were determined by FACS analysis of the expression of CD11c, CD86, CD80, and MHC class II (MHCII). To determine whether the differentiated DCs were active biologically, their ability to stimulate T cell proliferation was determined as described below. Cell viability was tested routinely before experimental analysis using trypan blue exclusion. In addition, we validated the lack of toxicity of the inhibitors used in the experiments by FACS analysis of propidium iodide (PI)-stained cells to identify necrosis or PI and Annexin VFITC double-positive cells as an indicator of apoptosis (19). CD11C+ cells were isolated from BM cells that had been cultured for 7 days, as described above, using anti-CD11c-coated magnetic beads (Miltenyi Biotec). The CD11C+ cells were then resuspended in fresh RPMI 1640 medium supplemented with 10% FCS, cultured for 24 h in the presence of LPS (1 μg/ml). The ability of the DC to stimulate T cell proliferation was determined using a MLR as described previously (16). Responder T lymphocytes were obtained by a nylon wool column enrichment of single-cell suspensions of splenocytes from C57BL/6j mice and resuspended at 2 × 106/ml in RPMI 1640 supplemented with 10% FBS. CD11C+ DC that had been cultured for 7 days, as described above, were resuspended in RPMI 1640 at various concentrations (3 × 103–3 × 105 cells/ml). Equal volumes of responding and stimulating cells (100 μl/well) were added to flat-bottom, 96-microtiter plates (BD Biosciences) and incubated at 37°C in humidified 5% CO2 air for 5 days. The absence of the proliferation of purified DC populations alone, or with syngeneic T cells, made irradiation unnecessary. Cultures were pulsed with 1 μCi [3H]thymidine per well for the last 18 h of culture (Amersham Biosciences). The cells were collected on cellulose filters with an automated harvester (Tomtech MacIII; PerkinElmer) and the incorporated thymidine was measured using a scintillation counter (MicroBeta 1450 Trimux; PerkinElmer Wallac). Single-cell suspensions of BM-derived cells that had been cultured, as described above, for 6 days were analyzed by FACScan flow cytometry (BD Biosciences) using four-color analysis with a combination of allophycocyanin-conjugated-CD11C (clone N418), PE-anti-CD86 (clone GL1), FITC-conjugated anti-CD80 (clone 16-10A), FITC-conjugated-anti-CD11b (Mac-1), and FITC-conjugated-anti-MHCII (clone 14-4-4S). Single-cell suspensions of cultured BM cells (1 × 106) were washed once with FACS buffer (5% FCS and 0.1% sodium azide in PBS) and incubated first with unconjugated anti-CD16/CD32 (Fc Block; BD Pharmingen) at 22°C for 20 min. Cells were then incubated with Ab coupled directly to fluorochromes, at dilutions determined by pretitration, for 20 min at 22°C. After staining, the cells were washed twice with FACS buffer and stored in PBS containing 2% paraformaldehyde until FACS analysis. Cells (30,000/sample) were analyzed by flow cytometry using a FACScan (BD Biosciences protocol; BD Pharmingen). Histogram analysis was performed using WinMDI software (trotter@scripps.edu). Three to five samples were analyzed for each treatment group. The results are presented as fluorescence histograms, with the relative number of cells on a linear scale plotted vs the relative fluorescence intensity on a log scale. TS/A exosomes or E-control-treated BM cells were lysed in radioimmunoprecipitation assay lysis buffer containing 1% Triton X-100, 0.1% SDS, 150 mM NaCl, 50 mM Tris-HCl, 1 mM EDTA, 1 mM EGTA, 5 mM sodium molybdate, and 20 mM phenylphosphate with protease and phosphatase inhibitors (1 mM PMSF, 10 μg/ml aprotinin, 20 μg/ml leupeptin, 20 μg/ml pepstatin A, 50 mM NaF, and 1 mM sodium orthovanadate). Total cell lysate (50 μg protein) was loaded per lane on a 10% SDS-polyacrylamide gel and subjected to electrophoresis. Proteins were blotted onto nitrocellulose membranes using a Bio-Rad mini protein II transfer apparatus. After overnight saturation at 4°C in PBS/0.05% Tween 20 containing 5% BSA (Sigma-Aldrich), the membranes were probed with Abs against Stat3, phosphorylated Stat3 (BD Biosciences), γ-tubulin, and β-actin (Santa Cruz Biotechnology) for 1 h at 22°C. The membranes were washed five times with PBS/0.05% Tween 20 and then probed with goat anti-mouse or anti-rabbit secondary Abs conjugated to Alexa Fluor 680 (Molecular Probes) or IRdye 800 (Rockland). Blotted proteins were detected using the Odyssey infrared imaging system (LI-COR). PBMC were obtained from healthy adult volunteers who signed informed consent forms approved by the Ethics Committee of the University of Alabama at Birmingham. In brief, PBMCs were isolated using Ficoll, as described previously (20), and anti-CD14 magnetic beads were used according to the manufacturer’s instructions (Miltenyi Biotec) to isolate monocytes from the PBMC. The purity of these monocytes, as determined by flow cytometry, was always >97%. Monocytes were placed in the wells of 12-well plates at a concentration of 1.25 × 106/ml RPMI 1640 medium (Invitrogen Life Technologies), containing GM-CSF (100 ng/ml) and IL-4 (1000 U/ml; PeproTech), in the presence or absence of exosomes purified from the supernatants of human breast tumor MDA-MB-231 cells. Every 2 days, 0.15 ml of medium was removed, and 0.25 ml of a medium containing IL-4 and GM-CSF was added. On day 6, the cells were washed with 0.5% PBS/0.02% BSA/sodium azide staining buffer (Mallinckrodt Baker), and stained using different combinations of fluorochrome-labeled mAbs against the following human proteins: CD14− (FITC) (clone M5E2), CD1a− (PE) (clone HB15e), and isotype-control mAbs (BD Biosciences). The cells were then washed once with staining buffer and fixed with 1% paraformaldehyde (Electron Microscopy Sciences). At least 20,000 cells were acquired on a FACSCalibur (BD Biosciences) and analyzed with CellQuest software (version 3.1). Dead cells and debris were excluded by forward and side scatter gating. RNA was prepared from CD11b+ BM cells that had been treated with either TS/A exosomes (n = 3) or E-control (n = 3) or PBS at a protein concentration of 1 μg/ml (n = 3) for 0 and 2 h. Each RNA sample was analyzed using an Affymetrix oligonucleotide microarray (Affymetrix). The gene microarray assay was conducted at the Differential Gene Expression Core Facility of the University of Alabama at Birmingham. Data were analyzed using three workstations running Affymetrix Microarray Analysis Suite software (version 4.01). The fold induction of each gene at given time points was calculated and expressed as exosome-treated sample − PBS-treated sample/E-control-treated sample − sample treated with PBS alone. Results are expressed as the mean ± SEM. The means of different treatment groups were compared by two-way ANOVA. Individual differences were further analyzed using the Bonferroni post tests. We have shown previously that sucrose density-purified tumor exosomes, in contrast to fractions that contain membrane proteins but not exosomes (E-control), promote tumor growth and metastasis by suppressing the host immune response (17). To determine whether BM cells are targeted by tumor exosomes in vivo, we injected mice i.v. with exosomes (50 and 100 μg/mouse) derived from TS/A tumor cells that had been labeled with PKH67 or nonlabeled TS/A exosomes (unlabeled exosomes served as an autofluorescent background control). The cells that took up the injected PKH67-labeled exosomes were identified by FACS analysis 24 h later. We found that a significant portion of PKH67-positive exosomes were located in the BM (Fig. 1⇓A). Within the gated R1 region (Fig. 1⇓A, inset), FACS analysis of the PKH67-positive cells revealed that the majority of these cells (94 ± 4% in BM; Fig. 1⇓B) were CD11b+Gr-1+ cells, indicating that they were myeloid cells. The staining was CD11b specific, as a control mouse IgG1 Ab did not stain the cells (Fig. 1⇓B). CD11b+ BM precursors are targeted by TS/A tumor exosomes. Ten BALB/c mice were injected i.v. with PKH67-labeled TS/A exosomes (50 μg and 100 μg of each mouse) or unlabeled TS/A exosomes (100 μg/mouse). BM cells were recovered after 24 h and subjected to FACS analysis. A, Fluorescent-positive cells. B, Within the gated R1 region, cell surface immunostaining with PE-conjugated anti-mouse CD11b and Cy5-Gr-1 and normal mouse serum IgG1 used as a control. A representative FACS graph of BM cells is shown (A and B, inset). The data represent the mean ± SEM from 10 mice from each group. To determine the effects of the TS/A exosomes on the differentiation of BM cells, exosomes were added to cultures of mononuclear cells, isolated from the BM of female BALB/c mice, and grown in the presence of the differentiation-inducing agent GM-CSF. On day 7, the expression of the DC surface marker, CD11c, and an MHCII Ag was determined by FACS analysis (Fig. 2⇓A). The number of cells expressing the DC marker CD11c was significantly lower in the cultures of mononuclear cells in which TS/A exosomes were added at the time the cultures were set up (day 0) than in the cultures of mononuclear cells treated with the E-control (Fig. 2⇓B). The addition of TS/A exosomes at later time points (days 1 and 3) also resulted in a reduction in the size of the CD11c+ cell population, but the effect declined with the delay in addition of the TS/A exosomes (Fig. 2⇓, A and B). These results suggest that the TS/A exosome-induced reduction in the size of the CD11c+ cell population was not due to a nonspecific cytotoxic effect on the BM cells. It also is unlikely that the reduction in the numbers of CD11c+ is due to a discrepancy in the sensitivity of BM precursor cells to apoptosis because there was not a significant difference in the percentages of PI+AnnexinV+ cells on treatment with exosomes or E-control (Fig. 2⇓C) at the 1-day or 3-day culture after BM cells were treated with TS/A exosomes. The number of CD11c+ is reduced, but the total cell numbers of exosome-treated cells compared with untreated cells are not significantly different (5.1 ± 0.7 × 106 and 5.7 ± 0.1 × 106, respectively; n = 10; p > 0.05), and flow cytometric analysis of the resulting cells showed that the majority of these cells subsequently gave rise to substantial numbers of F4/80+ macrophages. Total cell numbers of F4/80+ cells went up to 3.4 ± 0.4 × 106 in TS/A exosome-treated cells, compared with 0.8 ± 0.2 × 106 in untreated cells (n = 10; p < 0.01). TS/A exosomes block the differentiation of GM-CSF-stimulated BM precursor cells. Erythrocyte-depleted BM cells incubated with RBC lysis buffer to eliminate erythrocytes were cultured in RPMI 1640 supplemented with 10% FBS and 20 ng/ml recombinant mouse GM-CSF. TS/A exosomes or E-control (100 μg/ml) were added to the cultured cells at different times after the addition of the GM-CSF to the cultures (A and B). After 7 days of culture, cultured cells were analyzed by FACS for the expression of CD11c and IAd. One representative of four independent experiments is shown (A). The proportion of apoptotic (PI−Annexin-V+) plus dead cells (PI+Annexin-V+) (percentage) was determined by flow cytometric analysis following annexin V and PI staining 1 and 3 days after culturing. Representative figures are shown (C, inset). All FACS analysis results are presented as the average values ± SEM obtained for three samples in four independent experiments (B and C). To determine whether the CD11c+ cells that escape the TS/A exosome-induced block of myeloid cell precursor differentiation are capable of maturation, we harvested the TS/A exosome-treated BM cells on day 6 and stimulated the cells with LPS overnight. FACS analysis for the DC surface marker CD11c and the costimulatory molecules CD86 and CD80 indicated that significantly fewer BM cells were CD11c+, CD11c+CD80+, or CD11c+CD86+ (Fig. 3⇓A) than of BM cells treated with E-control. The degree of reduction of CD11c+CD80+ (Fig. 3⇓B) and CD11c+CD86+ (Fig. 3⇓C) was correlated with the concentrations of TS/A exosomes added to the culture, suggesting that the reduction of DC maturation is tumor exosome specific. TS/A tumor exosomes prevent DC maturation. Erythrocyte-depleted BM cells (1 × 106) were cultured in RPMI 1640 supplemented with 10% FBS and 20 ng/ml recombinant mouse GM-CSF. TS/A exosomes or E-control at 100 ng/ml (A) or various concentrations (B and C) were added to the cultured cells at day 0 of culture. Seven days after culture, the cells stimulated with LPS overnight were analyzed for the expression of CD11c+ (A), CD11c+CD80+ (B), or CD11c+CD86+ (C) using FACS. Alternatively, CD11c+ cells were isolated from the 7-day cultures using beads coated with anti-CD11c Ab. The purified CD11c+ cells were then used in a standard MLR reaction (D, CD11c:T cells = 1:10) or in a MLR, where increasing numbers of CD11c cells purified from 7-day stimulated BM DC pretreated with TS/A exosomes (10 μg/ml) (E) were used. Data are presented as the means of triplicate stimulated/unstimulated cpm of five mice from each group. Results are presented as the average values ± SEM obtained using five samples in three independent experiments. To further characterize the functional capacity of the CD11c+ DC that had been treated with TS/A exosomes, we tested the ability of the CD11c+ DC to stimulate T cell proliferation in a primary MLR-specific T cell activation response. BM-differentiated CD11c+ DC pretreated with various concentrations of TS/A exosomes at day 0 were cocultured with naive T cells isolated from C57BL/6j mice (DC:T cell ratio of 1:10) in a standard 96-h primary MLR. The ability of DC that had been pretreated with TS/A exosomes to stimulate T cell proliferation was significantly lower than that of DC pretreated with the E-control (Fig. 3⇑D). Thus, even though some myeloid precursors can differentiate into CD11c+ cells in the presence of exosomes, these DC appear to be unable to stimulate T cell activation, even though they express CD11c. The loss of the ability of the TS/A-treated myeloid cells to stimulate the T cells is unlikely to be due to a loss of their ability to take up Ag, as the uptake of FITC-dextran by DC in vitro was not affected by the treatment of the BM cells with TS/A exosomes or E-control (data not shown). Taken together, these data suggested the possibility that down-regulation of the costimulatory molecules induced by the TS/A exosomes may play a role in disarming the DC-mediated activation of T cells. However, in the presence of increasing numbers of 7-day cultured CD11c+ cells purified from BM cells pretreated with TS/A exosomes (10 μg/ml), T cell proliferation mediated by control CD11c+ is not suppressed in a dose-dependent manner (Fig. 3⇑E). To identify the effects of TS/A exosomes on gene expression in the cultured BM cells, we used microarray analysis to determine the gene expression profile at 0, 2, and 4 h after the addition of the TS/A exosomes. 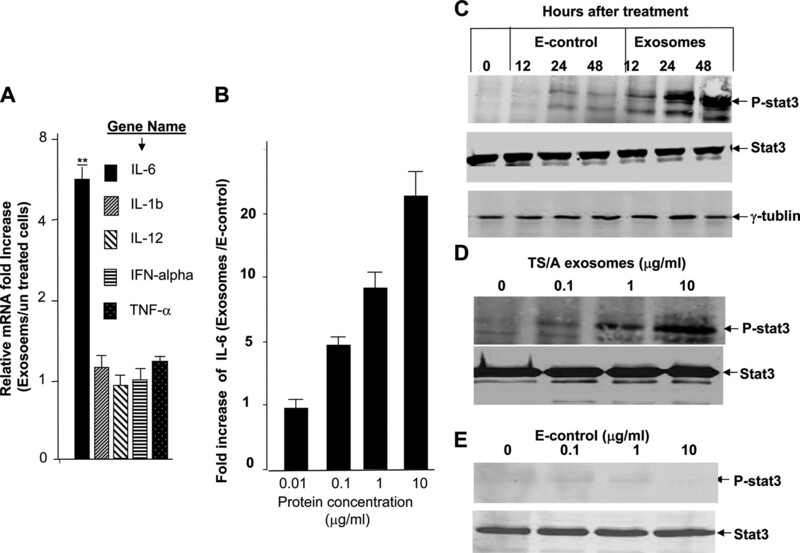 The transcription of IL-6 was found to be significantly higher in the cells treated with TS/A exosomes than those treated with E-control (Fig. 4⇓A). This was confirmed by ELISA analysis of the levels of IL-6 in the supernatants of 12-h cultures (Fig. 4⇓B). The induction of IL-6 was dependent on the concentration of tumor exosomes. Addition of 10 μg of tumor exosomes resulted in a >20-fold higher level of IL-6 (40.1 ± 2.6 ng/ml in tumor exosome-treated cells vs 2.4 ± 1.1 ng/ml in E-control-treated cells; Fig. 4⇓B). Exosome treatment results in the induction of IL-6 and phosphorylation of Stat3. CD11b+ cells were isolated from the BM of 2-mo-old female BALB/c mice by FACS sorting and stimulated with GM-CSF in the presence of TS/A exosomes or E-control at a protein concentration of 1 μg/ml for either 2 h for microarray analysis (A), or 12 h for ELISA analyses of proinflammatory cytokines including IL-6 (B). Data are presented as the fold increase of proinflammatory-related genes (A) or IL-6 protein (B) as compared with E-control-treated cells. The results represent the mean ± SEM of triplicate cultures of CD11b+ cells isolated from 10 mice analyzed separately. To determine the effect of TS/A exosome treatment on induction of phosphorylated Stat3, CD11b+ cells were treated with TS/A exosomes at 1 μg/ml (C) or at elevated concentrations of TS/A exosomes (D) or E-control (E), and phosphorylated Stat3 was detected by Western blot analysis at different time points (C) or at 12 h after culture (D and E). Total CD11b+ cell lysates were also used for determination of total Stat3 (D and E, bottom, and C, middle) or γ-tubulin (bottom) by Western blot analysis. IL-6 has been recognized as a potent cytokine that activates the Stat3 pathway. Treatment of BM cells with TS/A exosomes was found to result in a dramatically higher level of phosphorylated Stat3, as compared with the levels in E-control-treated cells after 12 h of culture, but did not have a significant effect on the levels of total Stat3 (Fig. 4⇑C). It is unlikely that this difference in the amount of phosphorylated Stat3 was due to differences in sample loading since the levels of γ-tubulin were equivalent in all of the experimental groups (Fig. 4⇑C, bottom). The addition of higher concentrations of TS/A exosomes resulted in a concentration-dependent increase in the levels of phosphorylated Stat3 (Fig. 4⇑D), but the addition of higher concentrations of E-control did not (Fig. 4⇑E), suggesting that the enhancement of phosphorylation of Stat3 is TS/A-exosome specific. These data indicate that TS/A exosome treatment leads to the induction of IL-6 and IL-6-mediated activation of the Stat3 pathway in myeloid precursors. We further analyzed the requirement for IL-6 in TS/A tumor exosome-mediated inhibition of BM DC differentiation using BM cells isolated from IL-6 KO mice. Using protocols identical to those described above, we found that the TS/A exosomes affected the differentiation of BM precursor cells isolated from IL-6 KO mice to CD11C+MHCII+ cells with the size of the CD11C+MHCII+ cell pool being 10.5 ± 1.8% for the exosome-treated cultures of BM cells from IL-6 KO mice vs 22.8 ± 2.8% for the E-control-treated cultures of BM cells from IL-6 KO mice. However, the effect was not as dramatic as that observed on the addition of exosomes to BM cells from the WT mice (4.2 ± 1.4% vs 23.6 ± 2.2% for E-control-treated cells; Fig. 5⇓A). As observed using BM cells from the WT mice, delays in the addition of the TS/A exosomes to the cultures results in a less-pronounced reduction in the numbers of cells expressing CD11c+MHCII+ (Fig. 5⇓B). The role of IL-6 in the TS/A exosome-mediated inhibition of BM precursors differentiation was further supported by the result obtained upon the addition of a rIL-6 to BM precursors isolated from IL-6 KO mice. In the addition of a recombination IL-6 compared with PBS used as a dilute of IL-6 at day 0 of the exosome-treated cultures, there was a significant reduction in CD11c+MHCII+ cells (4.9 ± 1.8% compared with 22.4 ± 2.1%, p < 0.05; Fig. 5⇓C). Tumor exosome-mediated induction of IL-6 plays a role in blocking the differentiation of CD11b Gr-1 cells. CD11b+ cells were isolated from the BM of 2-mo-old female or IL-6−/− of C57BL/6j mice by FACS sorting. Four × 106 CD11b+ cells were then used in differentiation experiments in the presence of GM-CSF (20 ng/ml) with/without TS/A exosomes (A and B). To determine the IL-6 effect on the TS/A exosome-mediated inhibition of CD differentiation, 4 × 106 CD11b+ cells isolated from IL-6−/− of C57BL/6j mice were also cultured in the presence of a rIL-6 (2 ng/ml) plus GM-CSF (20 ng/ml) with TS/A exosomes (C). After a 5-day culture, the expression of CD11c MHCII markers on the cell surfaces was determined by FACS analysis. A representative plot of five independent experiments is shown (A, inset). Results obtained from five independent experiments were pooled and are presented as the mean ± SEM (B and C). The asterisk above the bar indicates exosome treatment groups that differed significantly from the control group. ∗, p < 0.05; ∗∗, p < 0.01. Tumor-bearing mice have been shown previously to have significantly higher numbers of CD11b+Gr-1+ cells in the spleen and at tumor sites and to develop CD11b+Gr-1+-dependent immunosuppression (21, 22, 23, 24, 25, 26, 27). To determine whether tumor exosomes play a role in this accumulation of CD11b+Gr-1+ cells in the spleen, mice were administered TS/A exosomes by repeated i.v. injection. FACS analysis of the percentages of CD11b+Gr-1+ cells in the spleen indicated at least a 1.8-fold greater accumulation of CD11b+Gr-1+ cells (10.4 ± 1.8% in the exosome-treated group vs 5.7 ± 0.5% in E-control-treated group) in the spleens of mice injected with TS/A exosomes (40 μg/mouse) than in the spleens of mice administered E-control (40 μg/mouse; Fig. 6⇓A). This accumulation of CD11b+Gr-1+ cells was dependent on the dose of exosomes (Fig. 6⇓A) and required at least 20 μg of TS/A exosomes. 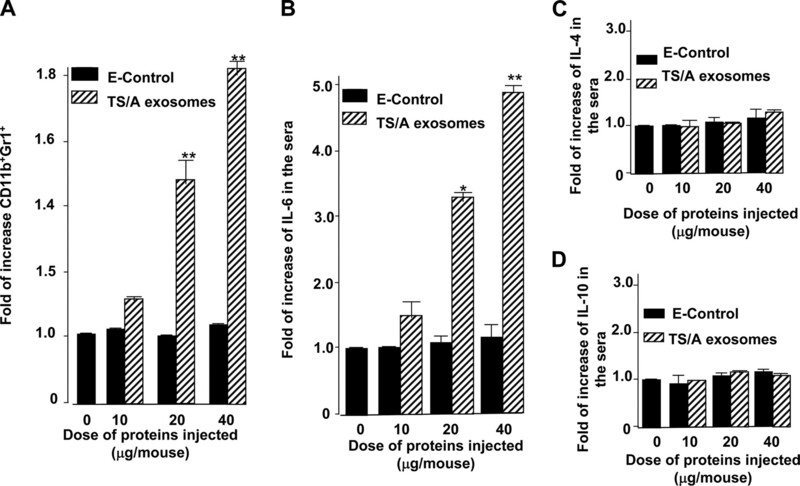 The administration of 40 μg of TS/A exosomes also led to a >4-fold higher concentration of IL-6 in the sera (50.5 ± 2.8 pg/ml in the exosome-treated group vs 10.2 ± 1.8 pg/ml in E-control treated group; Fig. 6⇓B). The injection of tumor exosomes affected the induction of expression of IL-6 preferentially, as the sera levels of other Th2 cytokines, including IL-4 (Fig. 6⇓C) and IL-10 (Fig. 6⇓D), remained unchanged at ∼10 pg/ml. Administration of E-control did not affect the levels of circulating IL-6, IL4, or IL10 (Fig. 6⇓, B–D). Injection of mice with TS/A exosomes results in the accumulation of myeloid precursor cells in the spleen and enhanced levels of circulating IL-6. Twenty 7-wk-old BALB/c mice were injected i.v. with various amounts of TS/A exosomes or E-control twice a week for 2 wk. Mice were then sacrificed, and the percentages of Gr-1, CD11b myeloid cells in the spleen were analyzed by FACS (A), or sera were collected before the mice were sacrificed and the levels of IL-6 (B), IL-4 (C), and IL-10 (D) were measured using a standard ELISA. Data are given as the average values ± SEM obtained for five samples in two independent experiments. ∗, p < 0.05; ∗∗, p < 0.001. To investigate the effect of human breast tumor cell-derived exosomes on the differentiation of DC, CD14+ monocytes were prepared from PBMC obtained from healthy volunteers. Exosomes isolated from MDA-MB-231 tumor cells at concentrations of 0.1 and 1 μg/ml were added to the cultures of CD14+ monocytes (1 × 106). Phase-contrast microscopy monitoring of the morphology of the cells on a daily basis during 5 days of culture indicated that most of the CD14+ cells cultured in medium containing GM-SCF and IL-4 remained loosely attached to the well and had a morphology typical of immature DC (i.e., they were large, exhibited an oval- or kidney-shaped nucleus with a high nuclear cytoplasmic ratio, and had nonvacuolated, occasionally granular cytoplasm with very fine cytoplasmic processes). In contrast, within 12 h of addition of tumor exosomes to the CD14+ cells, the cells became adherent to the plastic plates. The number of adherent cells was markedly higher after 2 days in culture, and the cells remained attached for the entire 5 days in culture. FACS analysis of the gated cells (Fig. 7⇓A, left upper corner of inset) after 5 days in culture with E-control revealed that ∼75.1 ± 5.2% of the CD14+ cells from eight different blood donors expressed CD1a+HLA-DR+, whereas only 6.4 ± 2.2% of cells exposed to tumor exosomes expressed CD1a+HLA-DR+ (Fig. 7⇓A). This reduction in the number of CD1a+ DC was dependent on the dose of tumor exosomes (Fig. 7⇓B). Addition of tumor exosomes at day 0 resulted in a greater reduction in the number of cells expressing CD1a+HLA-DR+ than did addition on day 1 (Fig. 7⇓C). Human breast tumor exosomes inhibit DC differentiation. A, CD14+ monocytes were differentiated in DC medium containing IL-4 and GM-CSF for 7 days in the presence of the exosomes isolated from breast tumor cell MDA-MB-231 or E-control at the concentration of 5 μg/ml or PBS as a control. Cells then were harvested and analyzed for CD1a HLA-DR-surface expression of cells gated in the R1 region by FACS (7A, inset, left upper corner). One representative experiment of five is shown (Fig. 7⇓A, inset). The results are presented as the mean ± SEM (Fig. 7⇓A). B, CD14+ cells isolated from peripheral blood with magnetic beads coated with anti-CD14 Ab were differentiated using an identical protocol as described above, except that exosomes were added at day 0 or day 1. Cell surface expression of CD differentiation markers CD1a and HLA-DR was analyzed by flow cytometry. Results obtained from five independent experiments were pooled and are presented as the mean ± SEM (Fig. 7⇓B). C, CD14+ cells were differentiated using an identical protocol to that described in B, but exosomes were added at different concentrations. Seven days later, cell surface expression of CD1a was analyzed by FACS. One representative experiment of five is shown (Fig. 7⇓C, inset) and the filled histogram is the isotype control. The results are presented as the mean ± SEM of five samples with five independent experiments. In summary, these data suggest that the exosomes produced by tumor cells act as potent immune suppressors by blocking DC differentiation. In mice, the exosomes are taken up by BM myeloid precursor cells (CD11b+Gr-1+). Upon administration of tumor exosomes, undifferentiated myeloid cell precursors accumulate in the spleen of mice and addition of tumor exosomes to myeloid precursors in vitro blocks differentiation. Although a few of the exosome-treated myeloid precursor cells can develop into myeloid DC in vitro, these cells are incapable of maturation and lose their ability to stimulate T cell activation. The reduced ability of tumor exosomes to block the differentiation of IL-6 KO mice BM precursors in vitro suggests a role for the tumor exosome-mediated induction of IL-6 in the blocking of DC differentiation. Additionally, tumor exosome-mediated suppression of DC differentiation was observed when a human tumor cell line was used as the source of tumor exosomes and human monocytes were used as the target cells. Taken together, these results suggest that tumor exosome-mediated suppression of DC differentiation may be one of the major mechanisms underlying the escape of tumors from host immune responses, which represents a major obstacle to successful cancer immunotherapy. The immunosuppressive effects that we report appear to be in contrast to previous reports of the ability of tumor exosomes to induce a host immune response and to augment tumor rejection in vivo (28, 29). However, in contrast to these published studies, and in agreement with our study, is recent work that suggests that tumor exosomes can act as potent immune suppressors of T cell immunity (30, 31). The reason for the discrepancies between these studies may be due to differences in the target cells used, and most especially the use of mature DC vs BM precursors. Whether tumor exosomes act as stimulators or suppressors of the immune response may depend on the developmental stage of the BM cells. Our data indicate that the addition of tumor-derived exosomes to BM-derived myeloid precursors on day 0 or day 3 after addition of GM-CSF was able to block DC differentiation, but addition of exosomes 5 days after addition of GM-CSF was ineffective. These data are consistent with the results of other investigators who have reported previously that immature DC pulsed with tumor exosomes at day 5 can stimulate a T cell response (28). Moreover, our in vivo results suggest that exosomes are uptaken by BM myeloid precursors. As a result, these precursors lose their potential to become DC or CD11c+CD80lowCD86low cells that may induce tumor immune tolerance. IL-6 is an oncogenic cytokine. It has been reported that the levels of IL-6 in ascitic fluids from patients with a variety of cancers are elevated and that the elevated levels of IL-6 in the sera of these patients are associated with an increased tumor burden and impaired survival (32, 33, 34, 35, 36, 37). The risk of breast cancer development also has been reported to be higher in individuals harboring certain polymorphisms of IL-6 (33, 38). The ability of IL-6 to activate the signal transducers and activators of the transcription factor Stat3 and to cause cancer-associated chronic inflammation is linked directly to the initiation of tumors and their development (39, 40, 41, 42, 43). The mechanisms that lead to the up-regulation of IL-6, and other soluble proinflammatory factors, in the tumor microenvironment have not yet been elucidated. We found that the administration of TS/A exosomes resulted in enhanced levels of circulating IL-6 in vivo and enhanced transcription and production of IL-6 in vitro. IL-6 has been shown to play a role in causing preferential differentiation of myeloid precursors into macrophages and the promotion of tumor growth (14, 44, 45). Our data suggest that the timing of the interaction of the exosomes with the myeloid cell precursors affects the outcome of the signal. One possibility is that the timing of the IL-6-mediated stimulation of the Stat3 pathway plays a critical role in the entry into either the myeloid DC or macrophage cellular differentiation pathways, as supported by our data that macrophages are increased by TS/A exosome treatment of BM culture. Identification of the factor(s) that determine the time-dependent responses may lead to the development of improved strategies for cancer immune therapy. In addition to blocking myeloid cell differentiation, tumor exosomes also may act to induce chronic immune tolerance. Our data suggest that a few of the myeloid precursors can differentiate into CD11C+ cells after treatment with tumor exosomes. These cells, however, lose their maturation potential and are unable to up-regulate their costimulatory receptors, including CD80 and CD86. The expression of CD80 (B7-1) or CD86 (B7-2) on DC are essential for T cell activation. A low-level expression of CD80/CD86 may result in the accumulation of CD4+CD25+ regulatory T cells and thus promote tumor growth by suppression of tumor cytotoxic T cell induction. As we reported previously, the inhibition of the immune function of tumor-derived exosomes is not restricted to TS/A tumor exosomes (17). Exosomes isolated from murine B16 melanoma cells and human A2058 melanoma cells also have similar inhibitory effects on the DC differentiation of BM cells isolated from BALB/c and C57BL/6 mice or human CD14+ monocytes (data not shown). These data suggest that tumor exosome-mediated suppression of DC differentiation may be considered to be a critical immune suppressor and prevent the successful use of cancer vaccines. The question as to which tumor exosome protein(s) or protein complex mediates the blocking of DC differentiation is of great interest. Because there are only a limited number of exosomal proteins that are unique to tumor exosomes and not found in exosomes derived from nontumor cells (e.g., DC), it is conceivable that the tumor exosomal proteins responsible for the blocking of DC differentiation could be identified. In the present study, although we focused on the biological effects of tumor exosomes on BM DC differentiation, tumor exosomes (100 μg/mouse) can also be up-taken by CD11b+ cells located in other organs, including the lung (1.2 ± 0.2%), spleen (0.62 ± 0.2%), and liver (0.88 ± 0.2%), but are undetectable in lymph nodes. In addition, spleen CD11c+ cells (0.4 ± 0.2%), also uptake tumor exosomes. Other investigators have previously shown that DC exosomes produced by DC can be up-taken by spleen CD11c to modulate DC activity. Our data show that tumor exosomes are also taken up by spleen CD11c DC. The physiologic relevance of targeting circulating tumor exosomes to the spleen, lung, and liver is unknown. Based on our results, it is tempting to postulate that BM DC precursors capture tumor exosomes and subsequently induce the production of IL-6 and other cytokines, leading to the activation of Stat3. As a result, differentiation of BM precursors into immature DC is blocked. Even though a few BM precursors escape the tumor exosome-mediated blocking of DC differentiation and become CD11c+ cells, these cells lose their function for stimulating T cell activation to the tumor exosome Ags. Unlike the uptake of DC exosomes that promote DC maturation, ingestion of tumor exosomes prevents DC differentiation, and instead causes the synthesis of proinflammatory cytokines. Different composition of exosomes released by distinct cell types or under dissimilar conditions may account for the influence of exosomes on DC differentiation and maturation. It would be very interesting in determining the significance of the effects of tumor exosomes on these CD11b+ and CD11c+ cells in terms of their differentiation and Ag-presenting function in an in vivo study. We thank Drs. Fiona Hunter and A. Jerald Ainsworth for editorial assistance. ↵1 This work was supported in part by grants from the National Institutes of Health (P30 AR48311, R01 CA116092, and R01 CA107181) and by Birmingham Veterans Administration Medical Center Merit Review Grants (to H.-G.Z.). ↵3 Abbreviations used in this paper: DC, dendritic cell; BM, bone marrow; KO, knockout; E-control, exosome control; WT, wild type; PI, propidium iodide; MHCII, MHC class II. Aalamian, M., I. L. Tourkova, G. S. Chatta, H. Lilja, E. Huland, H. Huland, G. V. Shurin, M. R. Shurin. 2003. Inhibition of dendropoiesis by tumor derived and purified prostate specific antigen. J. Urol. 170: 2026-2030. Bartz, H., N. M. Avalos, A. Baetz, K. Heeg, A. H. Dalpke. 2006. Involvement of suppressors of cytokine signaling in Toll-like receptor-mediated block of dendritic cell differentiation. Blood 108: 4102-4108. Lau, A. H., A. W. Thomson. 2003. Dendritic cells and immune regulation in the liver. Gut 52: 307-314. Schmitz-Winnenthal, F. H., C. Volk, K. Z’Graggen, L. Galindo, D. Nummer, Y. Ziouta, M. Bucur, J. Weitz, V. Schirrmacher, M. W. Buchler, P. Beckhove. 2005. High frequencies of functional tumor-reactive T cells in bone marrow and blood of pancreatic cancer patients. Cancer Res. 65: 10079-10087. Yang, L., D. P. Carbone. 2004. Tumor-host immune interactions and dendritic cell dysfunction. Adv. Cancer Res. 92: 13-27. Cammenga, J.. 2005. Gatekeeper pathways and cellular background in the pathogenesis and therapy of AML. Leukemia 19: 1719-1728. Della Porta, M., M. Danova, G. M. Rigolin, S. Brugnatelli, B. Rovati, C. Tronconi, C. Fraulini, A. Russo Rossi, A. Riccardi, G. Castoldi. 2005. Dendritic cells and vascular endothelial growth factor in colorectal cancer: correlations with clinicobiological findings. Oncology 68: 276-284. Dong, R., K. Cwynarski, A. Entwistle, F. Marelli-Berg, F. Dazzi, E. Simpson, J. M. Goldman, J. V. Melo, R. I. Lechler, I. Bellantuono, et al 2003. Dendritic cells from CML patients have altered actin organization, reduced antigen processing, and impaired migration. Blood 101: 3560-3567. Ninomiya, T., S. M. Akbar, T. Masumoto, N. Horiike, M. Onji. 1999. Dendritic cells with immature phenotype and defective function in the peripheral blood from patients with hepatocellular carcinoma. J. Hepatol. 31: 323-331. Carayol, G., C. Robin, J. H. Bourhis, A. Bennaceur-Griscelli, S. Chouaib, L. Coulombel, A. Caignard. 1998. NK cells differentiated from bone marrow, cord blood and peripheral blood stem cells exhibit similar phenotype and functions. Eur. J. Immunol. 28: 1991-2002. Ohm, J. E., D. P. Carbone. 2001. VEGF as a mediator of tumor-associated immunodeficiency. Immunol. Res. 23: 263-272. Peguet-Navarro, J., M. Sportouch, I. Popa, O. Berthier, D. Schmitt, J. Portoukalian. 2003. Gangliosides from human melanoma tumors impair dendritic cell differentiation from monocytes and induce their apoptosis. J. Immunol. 170: 3488-3494. Ratta, M., F. Fagnoni, A. Curti, R. Vescovini, P. Sansoni, B. Oliviero, M. Fogli, E. Ferri, G. R. Della Cuna, S. Tura, et al 2002. Dendritic cells are functionally defective in multiple myeloma: the role of interleukin-6. Blood 100: 230-237. Wolfl, M., W. Y. Batten, C. Posovszky, H. Bernhard, F. Berthold. 2002. Gangliosides inhibit the development from monocytes to dendritic cells. Clin. Exp. Immunol. 130: 441-448. Grizzle, W. E., J. D. Mountz, P. A. Yang, X. Xu, S. Sun, G. E. Van Zant, R. W. Williams, H. C. Hsu, H. G. Zhang. 2002. BXD recombinant inbred mice represent a novel T cell-mediated immune response tumor model. Int. J. Cancer 101: 270-279. Liu, C., S. Yu, K. Zinn, J. Wang, L. Zhang, Y. Jia, J. C. Kappes, S. Barnes, R. P. Kimberly, W. E. Grizzle, H. G. Zhang. 2006. Murine mammary carcinoma exosomes promote tumor growth by suppression of NK cell function. J. Immunol. 176: 1375-1385. Criddle, D. N., S. V. Madeira, R. Soares de Moura. 2003. Endothelium-dependent and -independent vasodilator effects of eugenol in the rat mesenteric vascular bed. J. Pharm. Pharmacol. 55: 359-365. Zhang, H. G., C. Liu, K. Su, S. Yu, L. Zhang, S. Zhang, J. Wang, X. Cao, W. Grizzle, R. P. Kimberly. 2006. A membrane form of TNF-α presented by exosomes delays T cell activation-induced cell death. J. Immunol. 176: 7385-7393. Edberg, J. C., R. P. Kimberly. 1997. Cell type-specific glycoforms of FcγRIIIa (CD16): differential ligand binding. J. Immunol. 159: 3849-3857. Dupuis, M., M. De Jesus Ibarra-Sanchez, M. L. Tremblay, P. Duplay. 2003. Gr-1+ myeloid cells lacking T cell protein tyrosine phosphatase inhibit lymphocyte proliferation by an IFN-γ- and nitric oxide-dependent mechanism. J. Immunol. 171: 726-732. Huang, B., P. Y. Pan, Q. Li, A. I. Sato, D. E. Levy, J. Bromberg, C. M. Divino, S. H. Chen. 2006. Gr-1+CD115+ immature myeloid suppressor cells mediate the development of tumor-induced T regulatory cells and T-cell anergy in tumor-bearing host. Cancer Res. 66: 1123-1131. Kusmartsev, S., D. I. Gabrilovich. 2005. STAT1 signaling regulates tumor-associated macrophage-mediated T cell deletion. J. Immunol. 174: 4880-4891. Makarenkova, V. P., V. Bansal, B. M. Matta, L. A. Perez, J. B. Ochoa. 2006. CD11b+/Gr-1+ myeloid suppressor cells cause T cell dysfunction after traumatic stress. J. Immunol. 176: 2085-2094. Melani, C., C. Chiodoni, G. Forni, M. P. Colombo. 2003. Myeloid cell expansion elicited by the progression of spontaneous mammary carcinomas in c-erbB-2 transgenic BALB/c mice suppresses immune reactivity. Blood 102: 2138-2145. Song, X., Y. Krelin, T. Dvorkin, O. Bjorkdahl, S. Segal, C. A. Dinarello, E. Voronov, R. N. Apte. 2005. CD11b+/Gr-1+ immature myeloid cells mediate suppression of T cells in mice bearing tumors of IL-1β-secreting cells. J. Immunol. 175: 8200-8208. Yang, R., Z. Cai, Y. Zhang, W. H. t. Yutzy, K. F. Roby, R. B. Roden. 2006. CD80 in immune suppression by mouse ovarian carcinoma-associated Gr-1+CD11b+ myeloid cells. Cancer Res. 66: 6807-6815. Andre, F., N. E. Schartz, N. Chaput, C. Flament, G. Raposo, S. Amigorena, E. Angevin, L. Zitvogel. 2002. Tumor-derived exosomes: a new source of tumor rejection antigens. Vaccine 20: (Suppl. 4):A28-A31. Andre, F., M. Andersen, J. Wolfers, A. Lozier, G. Raposo, V. Serra, C. Ruegg, C. Flament, E. Angevin, S. Amigorena, L. Zitvogel. 2001. Exosomes in cancer immunotherapy: preclinical data. Adv. Exp. Med. Biol. 495: 349-354. Whiteside, T. L.. 2005. Tumour-derived exosomes or microvesicles: another mechanism of tumour escape from the host immune system. Br. J. Cancer 92: 209-211. Taylor, D. D., C. Gercel-Taylor. 2005. Tumour-derived exosomes and their role in cancer-associated T-cell signalling defects. Br. J. Cancer 92: 305-311. Nicolini, A., A. Carpi, G. Rossi. 2006. Cytokines in breast cancer. Cytokine Growth Factor Rev. 17: 325-337. Kimby, E., J. Rincon, M. Patarroyo, H. Mellstedt. 1994. Expression of adhesion molecules CD11/CD18 (Leu-CAMs, β2-integrins), CD54 (ICAM-1) and CD58 (LFA-3) in B-chronic lymphocytic leukemia. Leuk. Lymphoma 13: 297-306. Grimm, C., L. Six, C. Tomovski, P. Speiser, E. Joura, R. Zeillinger, G. Sliutz, A. Reinthaller, L. A. Hefler. 2005. A common interleukin-6 promoter polymorphism in patients with vulvar cancer. J. Soc. Gynecol. Investig. 12: 617-620. Michalaki, V., K. Syrigos, P. Charles, J. Waxman. 2004. Serum levels of IL-6 and TNF-α correlate with clinicopathological features and patient survival in patients with prostate cancer. Br. J. Cancer 90: 2312-2316. Negrier, S., J. Maral, M. Drevon, J. Vinke, B. Escudier, T. Philip. 2000. Long-term follow-up of patients with metastatic renal cell carcinoma treated with intravenous recombinant interleukin-2 in Europe. Cancer J. Sci. Am. 6: (Suppl. 1):S93-S98. Bussing, A., G. M. Stein, C. Stumpf, M. Schietzel. 1999. Release of interleukin-6 in cultured B-chronic lymphocytic leukaemia cells is associated with both activation and cell death via apoptosis. Anticancer Res. 19: 3953-3959. Nicolini, A., P. Ferrari, R. Spinelli, A. Carpi, A. Sagripanti, F. Ambrogi. 1996. Cell-mediated immunity in breast cancer patients. Biomed. Pharmacother. 50: 337-343. Atreya, R., M. F. Neurath. 2005. Involvement of IL-6 in the pathogenesis of inflammatory bowel disease and colon cancer. Clin. Rev. Allergy Immunol. 28: 187-196. Becker, C., M. C. Fantini, S. Wirtz, A. Nikolaev, H. A. Lehr, P. R. Galle, S. Rose-John, M. F. Neurath. 2005. IL-6 signaling promotes tumor growth in colorectal cancer. Cell Cycle 4: 217-220. Corvinus, F. M., C. Orth, R. Moriggl, S. A. Tsareva, S. Wagner, E. B. Pfitzner, D. Baus, R. Kaufmann, L. A. Huber, K. Zatloukal, et al 2005. Persistent STAT3 activation in colon cancer is associated with enhanced cell proliferation and tumor growth. Neoplasia 7: 545-555. Godoy-Tundidor, S., I. T. Cavarretta, D. Fuchs, M. Fiechtl, H. Steiner, K. Friedbichler, G. Bartsch, A. Hobisch, Z. Culig. 2005. Interleukin-6 and oncostatin M stimulation of proliferation of prostate cancer 22Rv1 cells through the signaling pathways of p38 mitogen-activated protein kinase and phosphatidylinositol 3-kinase. Prostate 64: 209-216. Shouda, T., K. Hiraoka, S. Komiya, T. Hamada, M. Zenmyo, H. Iwasaki, T. Isayama, N. Fukushima, K. Nagata, A. Yoshimura. 2006. Suppression of IL-6 production and proliferation by blocking STAT3 activation in malignant soft tissue tumor cells. Cancer Lett. 231: 176-184. Encabo, A., P. Solves, E. Mateu, P. Sepulveda, F. Carbonell-Uberos, M. D. Minana. 2004. Selective generation of different dendritic cell precursors from CD34+ cells by interleukin-6 and interleukin-3. Stem Cells 22: 725-740. Walker, L., M. Lynch, S. Silverman, J. Fraser, J. Boulter, G. Weinmaster, J. C. Gasson. 1999. The notch/jagged pathway inhibits proliferation of human hematopoietic progenitors in vitro. Stem Cells 17: 162-171.